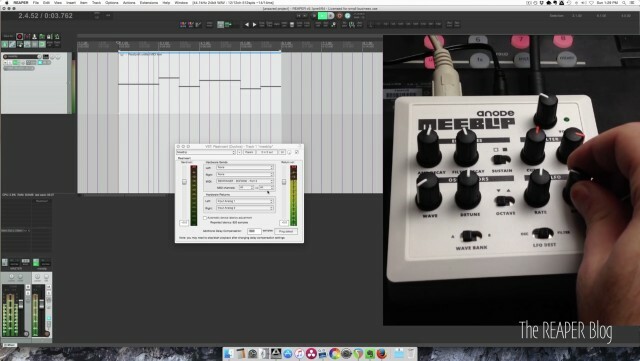 With a little setup, you can integrate a hardware synth with Reaper as if it’s a software plug-in. Check out the video tutorial from The Reaper Blog to see how. The price is nice, but an even better reason to respect Reaper is that the developers at Cockos consistently pack in lots of engineering details. The ReaInsert plug-in seen here is a good example. ReaInsert lets you individually map sends and returns for audio, remap MIDI channels, define volume for sends and returns, and even “ping” to automatically set delay compensation, all via a single interface. All of this is possible in other DAWs, but typically with more manual configuration in different locations, not what’s available here in this integrated interface. So let’s add up costs: Reaper is sixty bucks, our newest MeeBlip anode will set you back $120 (now, ahem, with free shipping, the Marketing Department would like to remind you, that department also being, erm, me) — throw in an audio/MIDI interface and you’re ready to go. Thanks, Jon, for the tutorial and the opportunity for some blatant synth promotion. Now I’m going to check out these other tutorials, and consider doing the next track in Reaper.